We hope you have Happy & Safe New Year! Enjoy 2019!! Generations Antiques and More has a total of twelve antique dealers plus the owners of Generations that supply the store with all the quality antiques, vintage items, primitives, art deco, rustic, mid-century, glassware, recycled or refinished furniture, collectibles and retro pieces that are sure to spark your interest and say "My parents had that years ago!" With all these individuals supplying great goodies for our store - we always have a very wide range of items for you to purchase. Have you ever walked into an antique store and been "sticker shocked?!?" You won't be here. We buy at the best price possible and turn that savings into your savings when you purchase it from us. Our stock is constantly changing (daily and weekly). We price items very reasonable (especially compared to ALL the other antiques stores in the Greater Cleveland Area). The owners price items so they should be sold within a 2 month period - thus keeping stock rotating quickly. 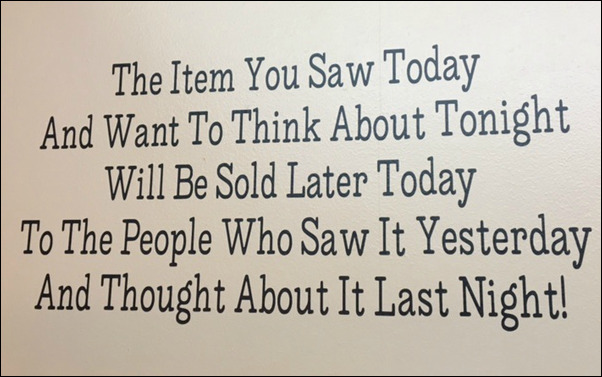 A wise customer coming into the shop, should buy the item they see and want, because it will be gone the next time they visit! Feel free to give us a review at Yelp and Facebook. Click the logos to do so! Check out the shop on New Day Cleveland! have a bunch more just like it! Come out this week to get all sorts of linens, doilies and fabrics—if it’s vintage...it’s on sale! Let's celebrate National Bean Day! Todd's Homemade Famous Chili!! It'll be warm and ready to eat by 11am. Christmas Shopping is not complete until you get your Cleveland products...we have that too!!! Retro Tin Signs—Most of the tin signs are made right here in Northern Ohio! We stock around 100 and can order up to nearly 800. We carry refrigerator magnets too! If you are special ordering, you’ll want to place it by December 15th. Vintage Reclaim and Design—Custom interior designed furniture and home decor for your home living spaces. Need something repurposed or entirely designed...they can do it. Just one piece or an entire room. Shop in their booth, review their design book, contact them for your next one of a kind masterpiece! These Cleveland area made products make great Christmas and Holiday gifts! Cleveland Wine and Beer Jam—an extremely popular brand, 7 flavors to choose from. Made in North Royalton. Sold by individual jar, gift packs or cases! We ship these too! Homemade holiday chocolate by Chocolate Dreams—once you try it—you’re hooked! Made in North Royalton. Made by the owners of Generations Antiques! Frank & Lily Handmade Soap—regular, goat milk and organic oil soaps—great scents make great gifts! Made in Broadview Heights. The Quilted Bug—well made hand sewn holiday and everyday items, custom orders too! Made in North Royalton. Handmade greeting cards, customized vinyl tiles and glassware by Lisa—artist extraordinaire with greeting cards, Lisa makes custom vinyl applications on all sorts of glasses, ceramic tiles and coasters. Check out her Browns, OSU and custom city & family windows. Holiday candy favors for Christmas parties, stocking stuffers or get-togethers! Made in North Royalton. New this year: Onesies with Vinyl!!! Hot item! Look what made it's way into the shop! Vintage 1950's Taper Tree - Aluminum 7' tree! This beauty is 7' tall, has all of its 201 branches, has a base that spins the tree and plays various Christmas music! It is in mint condition, was put up once before we got it. Comes with all the original boxes. I am also including 2 free color wheels too (they need a repair). If you are interested in this item, call our shop for details about it and pricing. If you know our shop, we have the best prices...you will NOT find another tree, like this, at the price we are offering. PERIOD! SOLD in 3 days!! Click me to get to the Midweek Coupon! eat dinner in North Royalton??? Check out or next door neighbors!! Our regular hours are 10am - 5 pm daily, opening at 11am on Sundays. "Ring in the New Year"!!!! Come in now thru Christmas Eve to get entered into the New Year's Eve kickoff basket! Enter as many times as you come in. Basket includes a bottle of champagne, 2 champagne glasses, ceramic "home" coasters, all the fiixin's for making Shiraz wine jelly meatball appetizers, crackers, and a gourmet selection of homemade chocolates! Winner will be announced via Facebook and our website on December 26th. SUGAR FREE Milk Chocolate Animals! Call us to discuss your chocolate needs. Congratulations to Richard D. on winning the $25 monthly gift certificate customer referral drawing! Bringing in a referral card pays off! Keep those customer referrals coming in!!! Make sure you try a sample of Cleveland Jam when you stop at the store! The only wine jelly made in Greater Cleveland. Try it and you'll be hooked! It comes and goes extremely fast here! If you want it, let the shop owners know what you are looking for...we'll get you on the list. Todd buys, restores and seasons our pans! If you want to restore your own cast iron, just ask Todd on how to do it. It takes a little time and a bunch of elbow grease...but the end result is beautiful. How to maintain your cast iron so it looks brand new: After you have cooked, get the pan hot again, get your kitchen sink water hot, put the pan in the sink (watch out for the steam), use a soft sponge or scrapper and wipe your pan down. Everything should come right off. DO NOT USE SOAP. Always re-season the pan after each use: Dry the pan, put it back on a burner, get it hot again, apply a little Crisco with a paper towel. Let it pan sit, see a little smoke, turn off the burner, wipe the pan dry with a clean paper towel. Another cool option: Using a cold pan, grind course salt (be liberal) onto the pan, add a few drops of cold water onto the pan, use a soft sponge to activate the salt & water together, clean the dirty area (comes right off). Re-season the pan as stated above. Looking to see what we might have at the shop? Here is a good indication! Our philosophy of acquiring general antiques and collectibles: Purchase them at a low and reasonable price and pass the savings onto the customer! So, as you shop at Generations, you will notice that are items are very reasonably priced to sell. Our philosophy on furniture: Most of our customers are not looking for higher priced furniture. As we shop for our customers, we normally look for furniture that we can sell for under $150. Every once in a while we make a great purchase on a higher end item...but we still pass that savings onto you. Looking for that hard to find item? Tell Todd or Lisa what you are looking for. If we don't have it at Generations or at our house, we will keep our eyes open when we are at estate sales, private sales and auctions. We'll contact you as soon as we find something that comes close to fitting your needs! A FRIENDLY WARNING: If you see an item that you are interested in, buy it when you see it. Because of our pricing, it will most likely not be there when you come back! Typically we price our finds so that we can sell them within 1-2 months, but they seem to be sold within just a few weeks. The following sign is in our reception area at our shop!